Hugh Mercer fled Scotland as a young man and began a new life in America. His hatred for the British brought him to the Revolutionary Cause easily. Mercer led troops early in the war and his death in the field made him a martyr to the Founding Generation. Hugh Mercer fled Scotland after he supported an unsuccessful attempt at dethroning the King in favor of Charles Edward Stuart. He arrived in Pennsylvania and set up shop as a doctor. Soon after he participated in the French and Indian War. During this time, Hugh became friendly with many Virginians, most notably George Washington. After being wounded in Western Pennsylvania, Mercer traveled alone and hurt through the wilderness for two weeks. When he arrived back at camp, he was promoted. He found himself in charge of Fort Pitt and led the construction of the first buildings in what would become Pittsburgh. After the war, Mercer purchased land from Washington and moved to Fredericksburg, VA. He started a new medical practice and apothecary with many notable patients. When British hostilities began, Hugh became a member of his town’s Committee of Safety. After a brief stint in the Virginia Militia, Mercer was appointed to the position of Brigadier General in the Continental Army. Hugh Mercer was chosen by the Continental Congress as the leader of the Flying Camp Battalion. Flying camps, common at the time, were segments of the military whose purpose was to be able to change locations very quickly. In doing so, they could defend a much larger area of land than a standard battalion. America’s Flying Camp Battalion was to be made up of men from Pennsylvania, Delaware and Maryland. These colonies were chosen because the middle of the Union was vulnerable, and it was thought wise to choose soldiers who lived in the area they were defending. That being said, the Flying Camp Battalion quickly found themselves in New Jersey. Mercer participated in the loss of Fort Washington and subsequently retreated with the Continental Army. He was present when Washington crossed the Delaware and led his men bravely at the battle of Trenton. The next day, on the way to Princeton, Mercer and his men were ambushed by redcoats. Hugh’s horse was shot out from under him and he was surrounded. After refusing to be taken captive and beginning to fight, he was bayonetted and beaten. Legend has it that when his men tried to remove him from the field, Mercer refused to leave. He was propped up under a large tree on the battlefield and continued to command the troops until Washington arrived to drive off the British. This tree - the Mercer Oak - would stand for over 200 years as a symbol of the fight for independence. Hugh Mercer would remain bedridden and die the following week. Mercer became a martyr to the American Cause. Hugh Mercer fled the British as a young man. When the time came to fight in the American Revolution, he readily took up the cause. Assembling the Flying Camp Battalion to defend a large area of land in the Middle Colonies, he was killed early in the war during the triumphant march through New Jersey. Don't forget to subscribe to our email list for a new Founder every day. 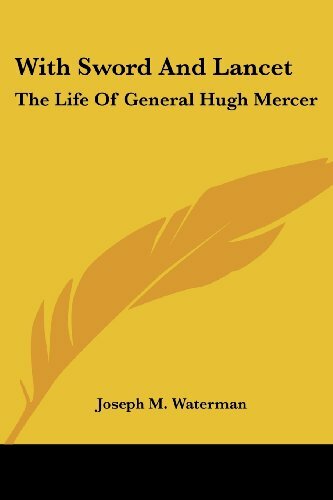 For more on Hugh Mercer, the Waterman biography is the most authoritative option. Purchases through this site go to Amazon at no extra cost to you. Apr 7 Horatio Gates - American Hero or Sneaky Administrator?